Are you salivating yet? Click here to read more about Shavuot on the farm from our friends at Ten Apple Farm. Click here for a recipe for the deliciousness you see in the picture above. There is a cheesecake sitting in my (boyfriend’s) refrigerator right now. At some point late last week I got it in my head that with Shavuot just around the corner I should make a cheesecake. Since I’m doing a time-share with my boyfriend’s kitchen, permission had to be granted by the relevant roommates, which was how I found myself late last night remembering how much I disliked baking. Rabbi Rebecca Rosenthal was ordained this May at The Jewish Theological Seminary in New York City. For the past three years she has worked as an educator at Congregation B’nai Jeshurun. She will be moving to El Paso, Texas this June with her husband Adam and her son Simon. In my family, holiday food traditions are never about what you might think of as traditional holiday food. Yes, we have matzah on Passover and apples and honey or Rosh Hashanah, but the traditions go deeper than that. At our Passover seder, we must have potato kuglets, made each year by different members of the family. No matter what else on the menu changes, the kuglets are how we know it is Passover, and not another festive meal. Before the fast of Yom Kippur, our traditional family food is honey chicken and noodles. Nothing else will get us through the fast, and no one thinks to suggest anything else. And then there is the Ten Commandments Cake on Shavuot. Shavuot: It’s Just Around the Corner! It’s just about that time of year again: the cream cheese is starting to thaw, the cheesecake recipes are dusted off, and the dairy, it is a’flowin. Welcome to Shavuout preparation! Shavuot is technically the end of the counting of the Omer, and is the traditional high holiday which celebrates G-d’s gift of the Ten Commandments. Shavuot is derived from the word for week and has a number of other intrinsic meanings as well. It is a very happy and joyous celebration, as it marks the most sacred gift to the Jewish people, that which continues to affect the daily lives of so many, that which is the basis of basically all Western civilization codes of morality. As we are educated by the Torah, so we educate ourselves for Shavuot. One tradition is to stay up all night long and learn the night of Shavuot… some mark the break of daylight by reading the 10 Commandments and then running into the ocean for an early morning dip for fun (well, at least in beautiful Santa Barbara!). Shavuot is almost here. I don’t need a calendar to tell me this; I know by the wheat combine driving up and down the fields. I admit I’m a sucker for the sight of shimmering expanses of wheat and agricultural machinery, sunflowers just starting to open and rows of sprinklers spraying jets of water into the sunset. (OK, I know the last is not exactly ecologically correct, but it invariably lifts my spirits.) In another month, the kibbutz wheat fields will be planted with the next crop, and the sunflower fields will start turning from vibrant yellow and green landscapes alive with the hum of bees to ghost fields of eerie dried-up flower heads on shriveled stalks waiting to be picked. When it comes to reasons for eating dairy on Shavuot, you have a variety to choose from. Here’s one that I like: on this day that commemorates receiving the Torah at Mount Sinai, we remember that the text should lie “like honey and milk” under the tongue (according to the Song of Songs). Why focus on this one? It gives me an excuse to make flan. 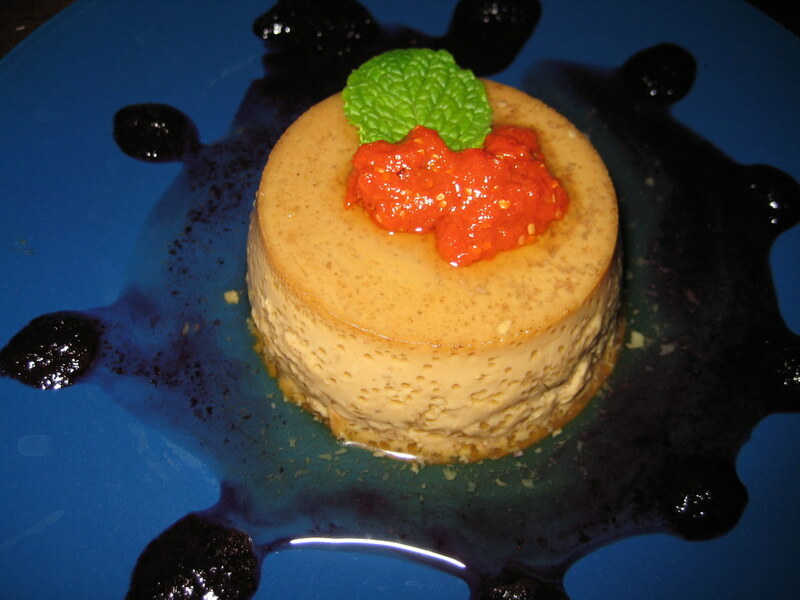 This dessert, which is known in Francophile circles as crème caramel, is both milky and sweet as honey. Here’s a recipe and a how-to for the tricky caramel part. This version adds the depth of coffee flavor and the bright note of raspberry sauce (the photo includes a dollop of goji berry sauce, too). Enjoy, and have a wonderful Shavuot! Looking for something to teach for tikkun leil Shavuot? Interested in exploring hunger, poverty and global justice? Sitting down to weekly Shabbat feasts and holiday meals, it seems unthinkable that hunger and malnutrition are still so widespread across the globe. Donor governments have developed systems of food aid and agricultural assistance yet such systems contain deep flaws that limit their capacity to create dignity and sustainability. American Jewish World Service (AJWS) invites you to join a conference call on May 20 at 1pm EST to discuss Jewish sources and learn about key issues in hunger and food aid. This Shavuot I baked, with the assistance of my son Max, a siete cieli (“Seven Heavens”) challah. It’s become a regular tradition in our family, along with cutting roizelekh (“roses”) from origami paper, to bake this Mt. Sinai-shaped round challah adorned with various symbols of Torah and revelation – the 2 tablets of the covenant, a ladder, a fish, a bird, and a hamsa. Max made the fish that you can see in the picture. There’s an excellent, illustrated description of how to construct the “seven heavens” challah in the cookbook by Rabbi Robert Sternberg, The Sephardic Kitchen, though I don’t use his recipe for challah. Rather, I use my favorite whole wheat challah recipe from Marcy Goldman’s Treasury of Jewish Holiday Baking. By the way, this is a fantastic cookbook. I have yet to bake a recipe from it that I haven’t liked. The whole wheat challah recipe follows below the break. I have also adapted this Shavuot hallah to celebrate the end of the term with my Wheaton College First Year Seminar “Rituals of Dinner” students, adding other, more contemporary dough symbols, i.e., a mortarboard hat and diploma. Growing up, Shavuot for me meant lasagna – a delicious, cheesy creation that my mother would make for the one Jewish holiday on which we did not eat meat. (Actually, I was an adult before I realized that non-kosher lasagna was made with meat). I loved the lasagna, and Shavuot wasn’t bad either. Special food, staying up late the first night with my friends- Shavuot was a hit, and I didn’t think about it more than that. One synagogue I went to hosted a “bikkurim (first fruits) procession:” they had people bring in baskets of produce and leave them on the bimah. I’d never seen a community mark Shavuot through any way but through a Tikkun Leyl Shavuot (staying up all night to study) and by eating blintzes, and I didn’t really know what to make of it. It seemed a little pagan. Jayne Cohen, author of the stunningly gorgeous new cookbook Jewish Holiday Cooking (witness above) is officially a new poster-woman for The Jew & The Carrot. A talented and creative chef and food writer, Cohen loves traditional Jewish dishes as much as she loves improvising with them, and has a weakness for the farmers’ market to boot. Welcome home, Jayne! She spoke with The Jew & The Carrot about her passion for fresh vegetables, the benefits of occasionally going pot-luck, “foodie poets,” and why real Jewish foods deserve real butter. Below the jump: The full interview, Jayne’s recipe for blintzes, and a chance to win a copy of Jewish Holiday Cooking.